In San Diego there was a fast food restaurant that I sort of fell in love with. The place was called CBW, I’m pretty sure it stands for Crazy Bowls & Wraps, and they serve salads, bowls, and wraps. What I really liked about this place was that they had 3 options for filling. White rice, brown rice, and quinoa(!!). Quinoa is not something that you usually see at a fast food restaurant, but I absolutely love it. It’s a super food because it is a complete protein, high in dietary fiber, magnesium, and iron, and it is a source of calcium. Needless to say, when I saw it on the menu the first time we went there I was pretty excited. 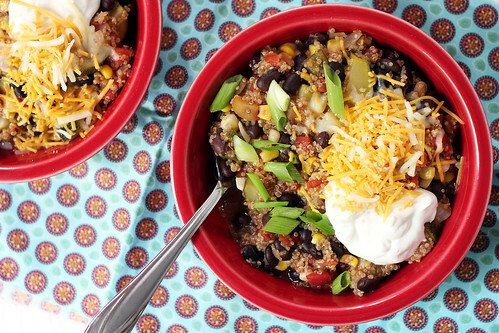 I had 2 favorite menu items that I liked to order and when I saw this Mexican Quinoa on Annie’s Eats last year, it immediately reminded me of one of those items. So I made it for dinner one night and it has quickly become a staple in our meal rotation. It’s quick and easy, filling, and super good for you. Over the year I have made some adaptations and bumped up the veggie content (to more closely match the bowl at CBW). That’s the other great thing about this meal, it’s another one that is versatile. You can adjust the veggies, add extra spices, use different kinds of canned tomatoes. When I photographed this meal I used fire roasted tomatoes and added smoked paprika and a dash of Chipotle chile powder to give it a bit of slow-cooked smokey taste. I love that I can make small adjustments like that so the meal isn’t exactly the same every time I make it (though it has always been delicious!). In a large skillet over medium-high, heat the olive oil. Add the jalapenos, bell pepper, and zucchini, cook for 2-3 minutes or until the vegetables start to soften. Add the garlic and cook until fragrant, about 30-60 seconds. Stir in the quinoa, broth, black beans, tomatoes with juices, and frozen corn. Season with salt, paprika, and chipotle powder (if using). Bring to a boil then reduce heat and put a lid on the skillet. Simmer for 20-25 minutes or until all of the broth/juice has been absorbed. Remove from heat and stir in the fresh cilantro and lime juice. Serve with sour cream, cheese, extra lime, avocado slices, and hot sauce. 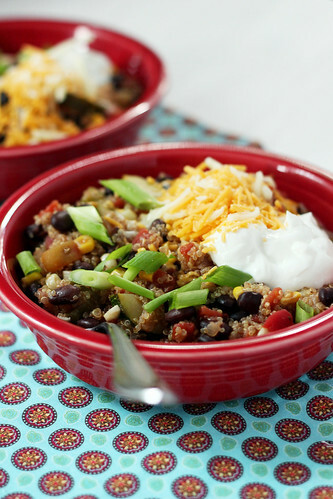 Here are some other delicious, and easy, vegetarian dishes! As I mentioned yesterday, I have been craving tangy dressing a lot lately. I’ve also noticed that I’ve been gravitating towards lighter, springy-er dishes. That could be pregnancy related or could be that I’m just really ready to move on from heavy winter dishes (even if I do live in San Diego). Either way, when a friend on a cooking message board I frequent mentioned a pasta salad including asparagus, I was immediately intrigued. 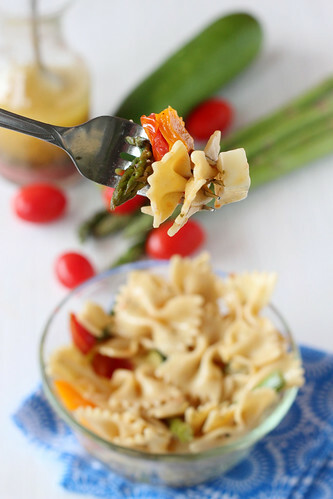 Suddenly vegetable pasta salad combinations were just swirling around in my head and I knew exactly what we were having for dinner. The plan was for me to make grilled chicken and serve it with a large side of this Roasted Vegetable Pasta Salad. The look on Jesse’s face when I told him the plan was kind of comical. He was sure that there should be some other side, or something! Much to his surprise (and my delight!) he loved dinner and he even felt full. It just goes to show that dinner doesn’t have to be heavy to be good. The leftovers also made an awesome lunch! Preheat oven to 375 degrees F. Toss chopped vegetables in 1 Tbsp Italian dressing (let marinate while the oven is preheating). Spread chopped vegetables out on a large baking sheet. Sprinkle with kosher salt. Roast for 25-30 minutes, or until vegetables start to soften and turn golden brown. Allow vegetables to cool to room temperature. While the vegetables are cooling. Bring a large pot of salted water to a boil. Add the dry pasta and cook to al dente according to the box. Drain, immediately rinse with cold water, and drain some more (you don’t want soggy pasta salad). 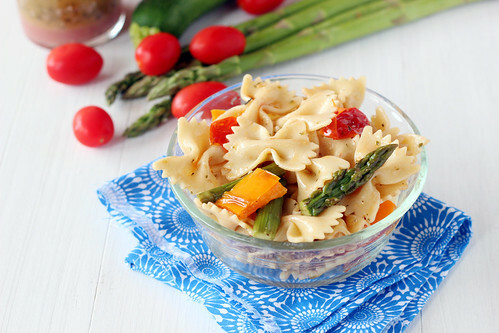 Once the pasta has cooled and drained, toss with the vegetables, cubed mozzarella cheese, and Italian dressing. If 1/4 cup of dressing doesn’t seem like enough to lightly coat all of the pasta, add a little more at time. This pasta is best if you let it sit for at least an hour before serving (it can also be made a day ahead of time). Here are a few more lighter side dish ideas! I’ve said it before and I’ll say it again, one really great thing about living in China is the accessibility to all sorts of fresh produce. I’m within walking distance to a wet market with probably 20 stands of nothing but fresh fruits and vegetables. A lot like the farmers markets that take place on the weekends in the summer in the US – except that it’s every day all year long. Even better are the prices. And the freebies – the girl at my favorite stand won’t let me leave without giving me something (usually green onions and cilantro) for free. 🙂 The corn has been especially delicious lately and it’s been made a lot of appearances at our dinner table. 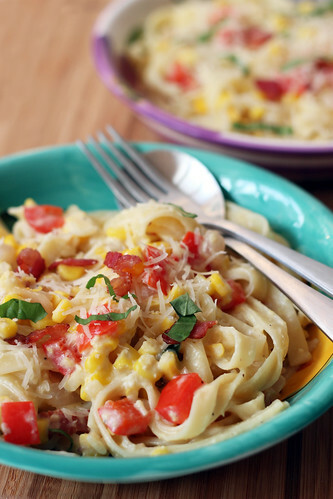 This Summer Sweet Corn Fettuccine seemed like a perfect use for the corn cobs I came home with a few weekends ago. And I really did love it. I did make a few adjustments to the recipe. I initially was going to cut everything in half, but then the sauce didn’t seem like it would be enough for the pasta (even though I was using less pasta) so I added additional milk. So in the end I used less corn than the original recipe, but it honestly seemed like just enough, any more might have been *too* much. As always though, I’ll list the recipe as I made it and link to the original, so it’s your call! Cook pasta according to box, then drain and set aside. 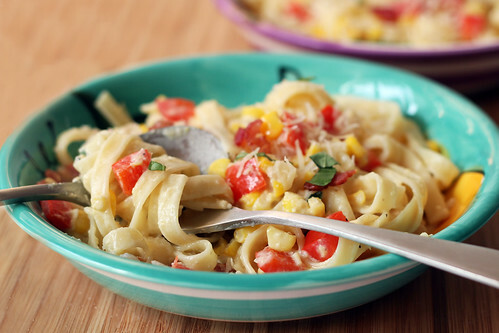 While the pasta is cooking, steady the corn in a large mixing bowl and cut the corn off of the cob. Switching to a butter knife, carefully scrape anything that is left on the cob, including the juices, into the bowl. Set aside. In a skillet over medium-high heat, cook the bacon until rendered and crispy. Remove the bacon from the pan and drain all but 1 tablespoon of the bacon grease. Set bacon aside. Add 2/3 of the corn and juices, red onion, and red bell pepper to pan. Season with salt and pepper and cook for about 5 minutes, or until vegetables are tender. While the vegetables are cooking, add the remaining corn, milk/half-and-half, thyme, and hot sauce to a food processor. Process until mostly smooth, set aside. Add the chicken broth to pan with the vegetables, reduce heat to low, and simmer for a few minutes to reduce. Pour in the corn/milk mixture and cook for another 4 minutes. Add half of the Parmesan cheese and stir until melted. Taste and season with additional hot sauce and s&p as needed. Add the pasta to the sauce along with half of the reserved bacon, stir to coat. Top with remaining Parmesan cheese, bacon, and basil. Serve hot and enjoy! Hi! I’m Jessica. I love cooking, baking, eating, and talking about food. My goal is to make cooking and baking, even from scratch, seem approachable. If I can give just one person the boost they need to try something new in the kitchen, I’ll be happy. Be thankful for good food!